Wondered why Prue and Paul have chosen Italian theme for this week’s episode? Not only is Italy a nation of foodies, but it provides the cultural backdrop for Prue’s beloved Angelotti family from her Food of Love trilogy. In this second book in the series, we see Angelica moving away from the family Italian food business. Zabaione is an old Venetian dessert traditionally made with Marsala wine (or sometimes vin santo), but here I’ve given it a southern Italian twist by using limoncello – a lemon-flavoured liqueur that is produced mainly in Campania. It’s made from Amalfi lemons, which are famous for their wonderful sweet flavour and fragrance and exceptionally large size. Raspberries are equally delicious with this dessert. Put the strawberries in a medium bowl with 4 tablespoons of the limoncello and 2 tablespoons of the sugar. Stir and set aside at room temperature for 1 hour, stirring every 10 minutes. Meanwhile, place the egg yolks in a heatproof bowl (preferably stainless steel) with the lemon zest and remaining sugar. Whisk using a balloon whisk until pale and creamy. Set the bowl over a pan of very gently simmering water. The base of the bowl should not touch the water. Add the remaining limoncello and whisk constantly until the mixture foams and thickens. This should take about 5 minutes; remember, the mixture will thicken further as it cools. Fill a slightly larger bowl with iced water and set the bowl with the zabaione mixture inside it. Leave to cool completely, stirring occasionally (it should take about 25 minutes). Put the cream in a medium bowl and whip until thick enough to form peaks. Gently fold a quarter of the cream into the cooled zabaione, then the remainder. 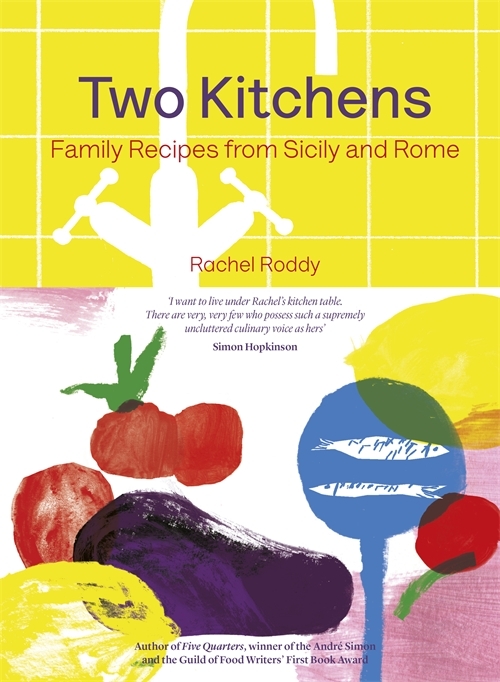 From the award-winning weekly Guardian Cook columnist and winner of the André Simon and Guild of Food Writers’ Awards comes an Italian food book of sumptuous recipes, flavours and stories from Rachel Roddy’s Two Kitchens in Sicily and Rome. For the last twelve years, food-writer, cook and photographer Rachel Roddy has immersed herself in the culture of Roman cooking, but it was the flavours of the south that she and her Sicilian partner, Vincenzo, often craved. Eventually the chance arose to spend more time at his old family house in south-east Sicily, where Rachel embraced the country’s traditional recipes and the stories behind them. In Two Kitchens she celebrates the food and flavours of Rome and Sicily and shares over 120 of these simple, everyday dishes from her two distant but connected kitchens. From tomato and salted ricotta salad, caponata and baked Sicilian pasta to lemon crumble, honeyed peaches and almond and chocolate cake, they are the authentic Italian recipes that you will want to cook again and again until you’ve made them your own.